Wow, we are absolutely thrilled with our home inspection report. It was very nice to meet you and we very much appreciated your time on Wednesday. We are very happy with our inspection report, as we find it very detailed and appreciate the accompanying pictures. If you are available, perhaps we would like to have you out again to ensure that the fixes were done properly. 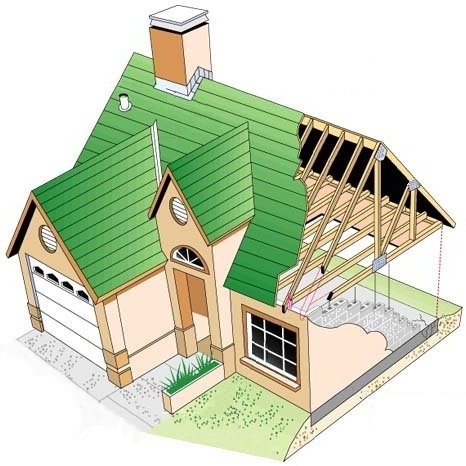 We are requesting all items be completed before we take possession on 2/1/14, and the roof is to be completed by 4/1/14. Again, we thank you for your time and professionalism. Thank you for coming out and do this for us. Thank you for services yesterday. I appreciate you taking the time to point out any nonconformance you found, making sure I was aware of where they were and what they impacted. The report looks great, it is clean and to the point and the pictures are very helpful. All and all, I felt very comfortable throughout the inspection. Thank you very much Dean. We were very happy with your services and appreciate you doing our inspection. Thank you so much for your courteous and speedy service!!! We will keep you in mind for future services. Thanks for the prompt sending of the report. This will be helpful in getting the home ready to sell. Thanks again. We appreciate your thorough inspection. It was also nice to meet you. Thanks Dean for your report regarding Radon test on the property. You are definitely one of the best inspectors I've ever dealt with. I will surely refer you to my friends. Thank you so much for your inspection and the cool report. I know many neighbors because I take a walk a lot. So I will recommend you to my current house neighbors and the new neighbors if they need to buy a new home. Thank you so much for your help again. Have a wonderful holidays ! I hope you have a happy holidays ! Thanks for your report. It is very clear. Thank you for the thorough report. My apologies for not responding sooner. Thank You so much for your detailed report and helpful hints. Your given us great piece of mind knowing that the house was inspected so thoroughly. Darin has just informed us that you have gone out of your way again with the termite inspection. We were led to believe that was a seller responsibility. Thank you. May the new year be happy and healthful for you and your family. Thank you for a complete and thorough report. I was a pleasure working with you and your “helper” on Friday. Have a “safe” rest of the summer! Got the email. It was nice meeting you as well. My fiancé and I greatly appreciate you driving out and doing it for us. opinion on this small cottage. As you can imagine I am going to pass on this purchase! Thank you so much for your thorough inspection and quick delivery of the report. I will make sure to pass along your name to anyone looking for an inspector. Thanks a lot, Dean. It meant a lot to have you come on such short notice during the holiday season. Thanks for all your help honesty when you inspected the house. We are signing the closing papers on Wed. This is Jessica & Ty... we just got our full inspection report from you (so fast) and I wanted to shoot an email back confirming that we got it. It's very detailed and helpful and so much more than expected. We're so glad Hollie recommended you to take a look at our home, you made us feel,very comfortable and at ease during the whole process, which is very appreciated... this can all be so overwhelming! Thank you for putting together a great document for us to keep and refer back to as needed and as rookie homeowners. We appreciate you sharing your knowledge and expertise with us as we begin this adventure as first time buyers. We now feel even more confident we found a great home(*phew*) and we would not hesitate to recommend your service. What an excellent job!! We are very satisfied with your services and will certainly recommend you if the occasion arises. We were very impressed with the way you did your inspection. Thank you very much. Thank you for the through inspection of the home. The walk through and the final report provide us a confidence boost during the nerve racking process that is buying a home. You also identified the little gremlins we would have missed and we can address those minor issues before they become significant (i.e. $$$$). It was very nice meeting you and thanks again. It was a pleasure to meet you! Thank you very much for all of your advice. My wife and I feel VERY comfortable buying this home thanks to you!! What an excellent report you assembled. I do have some questions I would like your response to. Just a quick email to check on the well water results and to thank you for your thorough inspection of our soon-to-be home. Tim and I feel confident in our purchase based on your good report. We have already purchased the necessary materials to fix the areas of recommended repair. The home owner did find the septic and is having it pumped/inspected which is a huge bonus. Thanks again for doing such a great job and making yourself available for questions after move-in. Thanks Dean for the prompt results, looks like we're in good shape. Thank you for taking time to explain things to me during the inspection. I read the report over the weekend and it was easy to follow and very thorough. I may have some questions when I get into the house and start repairing the things you pointed out. I will let you know if I do. the radon testing, that helped but my mind at ease, thank you again. I hope to get your more business in the future. We are very happy with the inspection. Thank you for the attention to detail. We will gladly recommend you to anyone in need of an inspection. Thank you for the very thorough and professional home inspection report. Could you mail me a "good old-fashioned" hard copy of it? I would just like to thank you for all you have done. I appreciate you being so thorough and detailed. I am very pleased with the job you did and feel it was money well spent. Anna and I will surely be recommending you to others in the future. I just have one issue that I was hoping you could take care of for us. We plan to ask the bank to cover more closing costs due to the water softener working improperly and the sprinkler system not being winterized. I just noticed you did not mention anything about it in the report. Could you add this to the plumbing report so that I have your expert opinion on the matter included in the inspection? I'm sure this will come up in your water report as well because it should test for a high hardness level. Thanks again Dean, you do great work! Sorry for the lack of response. I really appreciate all of your efforts and thorough explanations thus far. I definitely learned a few things and became more informed about our home we are working on purchasing. You removed all the uncertainties we had about the home, which made it well worth the cost of the inspection. P.s. We are working with the seller to take care of the issue we found as a result of the water test. Thank you for the wealth of information you provided during the inspection and for welcoming my questions post inspection. It was truly a pleasure working with you. I am pleased with the results and the timely provision of the inspection results. Lourie and I just reviewed your report, looks great. Thank you again for doing an excellent job. Thanks for the home inspection, septic evaluation and water test. We are very pleased with all the detail that you included. Thank You for all your time today,and getting us this report so quickly.We will definatly recomend you to all our friends and family. Thanks for the report and all the time you took with us explaining everything about the home. Thank you Dean very nice report. We are still trying to get a response from the condo association. We are probably going to walk away because the water issue even though the association has to fix not sure how much expense we will get into. It was a pleasure meeting you. I will definitely keep you in mind when my clients are looking for a good inspector. I appreciate your thorough inspection and detailed report ... looks like I'll be closing this week! Thanks for all your help yesterday. The report looks great. Thank you very much for doing our inspection today you were very very very thorough!, and you went into places in the home that I would not have ever thought of going. I will recommen you to all of my friends who are looking to buy a home. I really appreciate the thorough job you did inspecting the home and compiling this report. I appreciate you taking the time to come out so quickly and do such a thorough job. We really appreciate it! Thank you so very much! as always you're such a great person to work with thanks for all the extras. So sorry about the utilities. Were you able to do everything or do you have to come back? It was a pleasure meeting you as well and I am going to include you on our list of GREAT Property Inspectors. Century 21 Property Mart, Inc.
We appreciate your quick response.